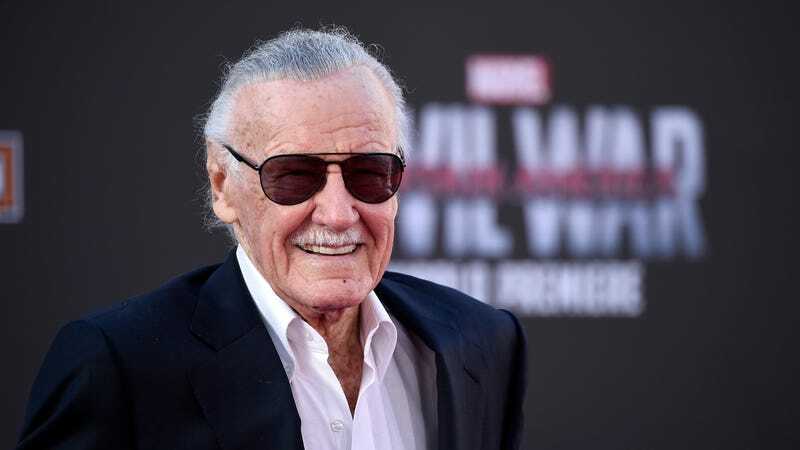 Stan Lee, comics-industry legend and co-creator of such timeless characters as Spider-Man, Iron Man, Black Panther, Thor, the X-Men, and the Fantastic Four, has died. The Hollywood Reporter confirms the news. He was 95. Lee was born Stanley Lieber in New York City in 1922, and as a teenager during the depression, he worked odd jobs to help his cash-strapped parents. One of these jobs was as a gofer for Timely Publications, where Lee met Joe Simon and Jack Kirby, the creators of Captain America. Lee learned everything he could from the duo, and when Simon and Kirby were let go from the company, Lee took over their jobs editing Timely’s comics. He was 18. Lee took a break from Timely to enlist during WWII, serving in the signal corps before eventually becoming a writer for the Training Films Division, making him only one of nine servicemen with the classification “playwright.” Upon returning from the war, he married Joan Clayton Boocock, who he remained with for over 70 years. The two had a daughter, Joan Celia, in 1950. In 1953, a second daughter, Jan, died after only three days. Lee continued to run Timely’s comics department through the 1950s, simply producing whatever stories he was assigned. Westerns, horror, crime—at the time, there were a number of genres competing with superheroes on more or less equal footing, and Lee wrote for them all. But in 1961, Lee’s wife suggested that rather than writing simply to please his boss, he try telling stories his own way. Taking inspriation from Detective Comics’ hit Justice League, Lee came up with his own superhero team: The Fantastic Four. The title was successful enough that Lee launched one hit superhero title after another in its wake, and gave the company a new name: Marvel. In co-creating a roster of titles that also included Spider-Man, The Incredible Hulk, Iron Man, Daredevil, and X-Men, Lee did more than launch a comic book company that became a 21st century media juggernaut, and more than populate generations of American kids’ imaginations. Lee, with collaborators like Kirby (who he hired back) and Steve Ditko, changed the way comic book stories were told. The previous generation of superheroes, represented by Detective Comics’ mainstays like Superman, Wonder Woman, and Batman, were larger-than-life archetypes. Lee made his heroes down to Earth. Spider-Man could sling webs and soar through the city fighting evildoers, but he still had to deal with money woes and relationship problems, just like any other teenager. Lee’s heroes often a contentious relationship with the public, and even with their own powers. While the Flash never questioned the benefits of running fast, characters like the Hulk, Cyclops, and Thing saw their powers as a burden as often as a blessing. The public responded to this more nuanced storytelling, as nearly all of Lee’s titles were instant successes. Through the ‘60s, Lee managed to write and art-direct nearly every Marvel comic, while maintaining relationships with fans and tirelessly promoting the imprint. Lee’s enthusiasm for his comics was infectious, and every alliterative, adjective-filled missive to the readers overflowed with Lee’s boundless energy, all signed off with his trademark, “Excelsior!”. Lee, Kirby, and Ditko also maintained airtight continuity across all of Marvel’s titles, something that had never been attempted before. Not only did Lee’s characters build up a history, storylines could carry over from Fantastic Four to The Incredible Hulk, and Spider-Man could show up in an issue of X-Men, without interfering with the ongoing story in his own book. In 1972, Lee stepped back from his prolific writing duties to serve as publisher of Marvel. In that role, he continued shepherding ideas and tirelessly promoting the company, and comic books in general, and narrating Spider-Man and Hulk animated series in the early ‘80s. But in 1996, with comic sales in a slump, and the company’s finances overextended with investments in other entertainment properties, Marvel went bankrupt, and Lee was pushed out. Eventually, he was invited to return as chairman emeritus, a “strictly honorary” title that allows him to write the occasional comic and serve as the company’s public face, a role Lee relished for the rest of his life. In the meantime, Marvel grew into the juggernaut it is today, with the characters Lee created anchoring a string of top-grossing films (Lee himself has made cameos in 24 of them) and TV series following Disney’s acquisition of Marvel Entertainment in 2009. The last year of Lee’s life was sadly marred by legal battles. He sued POW! Entertainment, the company he co-founded in 2001, for allegedly tricking him into signing over rights to his name in a bizarre case of what appeared to be bad actors all jockeying for control of Lee’s estate. That lawsuit against POW! was dropped in July, just after Lee filed for a restraining order against a former business manager who had been accused of taking advantage of his “impaired hearing, vision, and judgment.” After dropping the POW! suit, Lee released a statement indicating that he was “thrilled” to be back with people who truly had his best interests in mind, rather than simply wanting his money.